It’s a motto, an expression of pride and a call to arms for supporters of Bayern Munich, the powerhouse that furnished the foundation of Germany’s World Cup-winning side. It’s a uniquely Bavarian spin on a German phrase that translates roughly to, “We are who we are.” In other words, as far as its supporters are concerned, Bayern’s strength flows from a deep sense of understanding and pride in its roots. 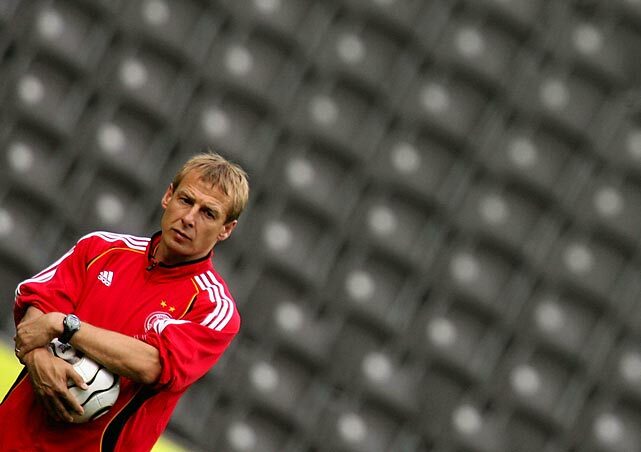 Jurgen Klinsmann spent two seasons playing for Bayern, where he won a Bundesliga title and the UEFA Cup. He then managed the club for the better part of the 2008-09 campaign. He’s surely intimately familiar with “Mia san mia.” He must understand the power, durability, and even the burden of identity. When Klinsmann took over the U.S. national team in the summer of 2011, he was charged with taking American soccer to the next level. He brought global credibility, a World Cup winners’ medal and lots of big ideas. He wasn’t beholden to the status quo. In fact, he hoped to overhaul it. Soccer occupied a unique place on the U.S. landscape. It was an awkward adolescent and the country’s fourth favorite team sport, at best. For-profit youth clubs, the NCAA and a nascent professional league that looked so different from foreign counterparts presented significant hurdles. The resources were there but the culture was lacking. To catch up, the new manager argued, the U.S. had to build the sort of crucible that proved so effective in the countries he hoped to beat. There was a blueprint out there, and it was time to get serious. Two weeks ago, Klinsmann took his team to Chile, where a La Roja squad featuring just two 2014 World Cup players overcame a deficit and pressured and passed the U.S. into submission. The 3-2 defeat in Rancagua was the Americans’ third straight. It lifted the U.S. winless streak to five and, more importantly, extended the period since Klinsmann’s team had played a complete, 90-minute game to around eight months. In three-and-half years, which included a World Cup where it was outplayed in three of four matches, out-possessed by an average of 56.5 percent to 43.5 percent and outshot by a whopping 94-44, the U.S. rarely has imposed its game on a non-CONCACAF opponent. Good results against good teams have come here and there. There were the friendly wins in Genoa and Mexico City and the group stage defeat of Ghana in Natal. But those victories were the result of resolute effort, cohesive defending and opportunism – the things the U.S. always has done pretty well. There was little sign of an emerging, more "proactive" style. Klinsmann has tried just about everything. He’s overhauled his tactics and then overhauled them again. He’s implored and even forced his players to do more – to work harder in an effort to create a fitter, smarter, more committed athlete able to succeed at the highest level. He’s challenged them publicly in a manner no predecessor could have imagined, perhaps hoping to create the sort of scrutiny and pressure present in more established soccer countries. He’s taken shots at the foundation of the American game, from the way young players develop to the way MLS structures its season. And he’s let it be known that it’s his way or the autobahn. 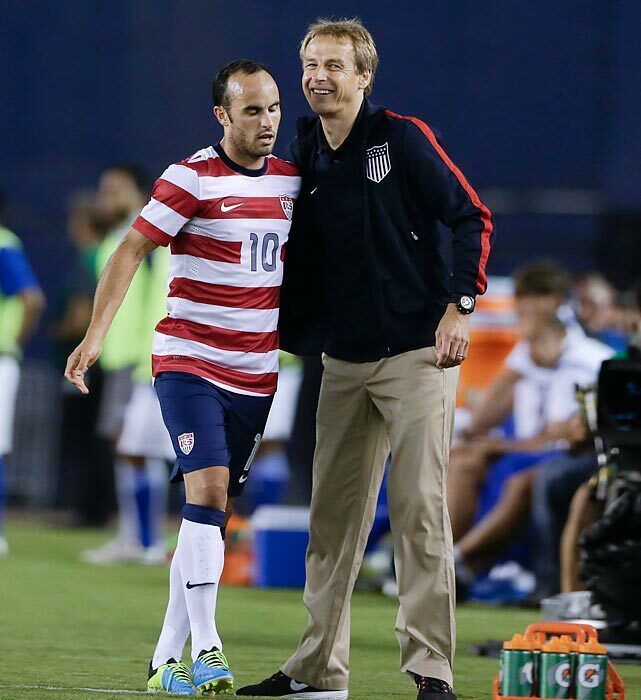 Other coaches saw the value in working with the idiosyncratic Landon Donovan. He was worth the extra effort. Klinsmann sent the best player in U.S. history packing. And so the Americans took the field against Panama on Sunday looking to end what amounted to the first crisis of confidence of the Klinsmann era. While it took time for his players to become accustomed to his coaching, fans and the press always seemed solidly behind the big-idea man. And it wasn’t the Donovan issue or the skin-of-their-teeth escape from Group G that created the concern. It was a series of exhibition setbacks at the dawn of the next World Cup cycle. 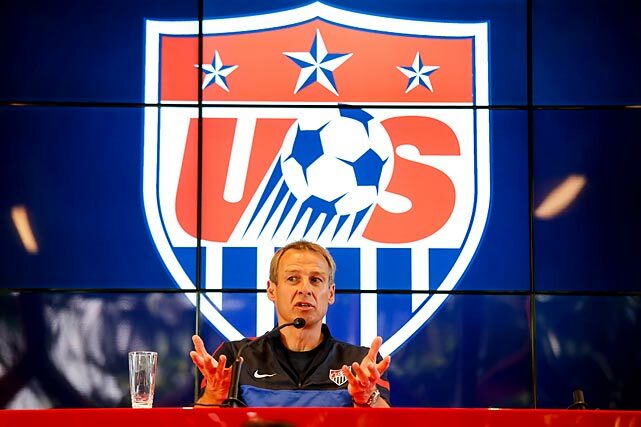 There were columns last week that questioned Klinsmann’s acumen and approach. On game day, there were banners at StubHub Center reading “JK Out” and “Red card the coach." The underlying reason for the consternation was that the U.S. still wasn’t playing the sort of soccer Klinsmann had promised. And instead of tangible progress, there was debate about who should be deployed where and even whether the players were fit. If they were overtrained, exhausted and injury prone, then that’s on Klinsmann. If they lacked the discipline or structure to meet the manager’s benchmarks, then it’s a symptom of a larger problem he may be unable to solve. Either way, it isn’t a conversation anyone expected to be having in 2015. After a relatively easy 2-0 win over a poor Panamanian side, Klinsmann reiterated his interest in re-evaluating the future of the January camp. Perhaps, he said, it should focus on the Under-23s in 2016, which is an Olympic year. Perhaps more progress can be made at the youth level. The junior national teams have struggled since Klinsmann, who’s also the U.S. Soccer Federation’s technical director, took over. The Olympic qualifying failure in 2012 stole the headlines. But the U-20s were poor (albeit ultimately successful) in last month’s U-20 World Cup preliminaries and the U-17s failed in their most recent qualifying bid. If there’s another Donovan or Clint Dempsey coming through the pipeline, he remains unidentified. Klinsmann has three years to go on his coaching contract and he’s now face-to-face with a harsh but reasonable reality. The core of the senior squad now plays in MLS. U.S. players aren't going to reject multi-million dollar contracts that offer the prospect of professional respect, responsibility and the opportunity to live near home. The league isn’t about to lengthen its season or overhaul the calendar to avoid more international dates. And it’s not going to create the level of roster and playing-time competition that Klinsmann believes is necessary any time soon. Winter and playoffs account for the former, and $100 million in annual losses explain the latter. The NCAA isn’t going away, and the U.S Soccer Development Academy, which includes MLS’ youth programs, is still finding its way. WAHL: What are the ramifications of USA's support of Prince Ali? Soccer is the most popular sport in Scotland. And it’s the most popular sport in each of the eight countries that has won a World Cup. What Klinsmann hopes to build here requires a culture, infrastructure and collective desire that simply couldn't be fashioned in the quarter century that’s elapsed since the Americans qualified for Italia ’90. The youth environment remains too forgiving. The market is still so segmented. There are too many sports and too many options for both the prospective player and the fan. 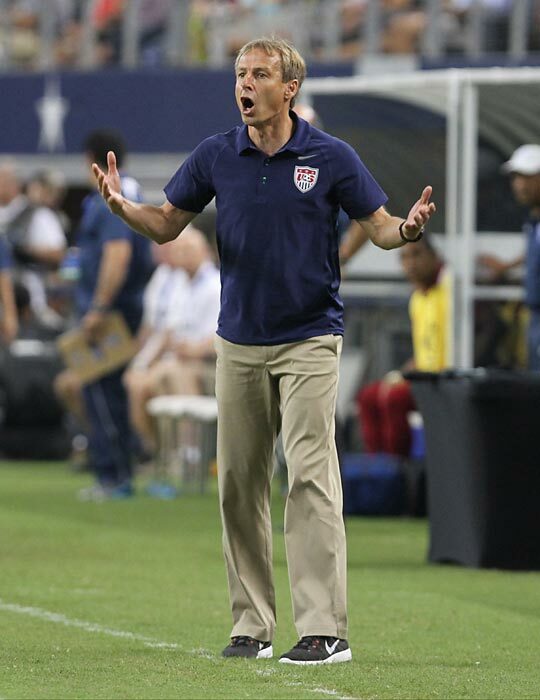 It's not possible now to create the single-mindedness Klinsmann is seeking. His predecessor, Bob Bradley, coached the match in front of him. He designed a game plan to beat Spain that day in Bloemfontein and with a keen understanding of their strengths and weaknesses, his players executed. When Bradley’s team was able to play with a bit more dynamism and flourish, it did so knowing it had a solid base and structure to fall back on. It had an identity. 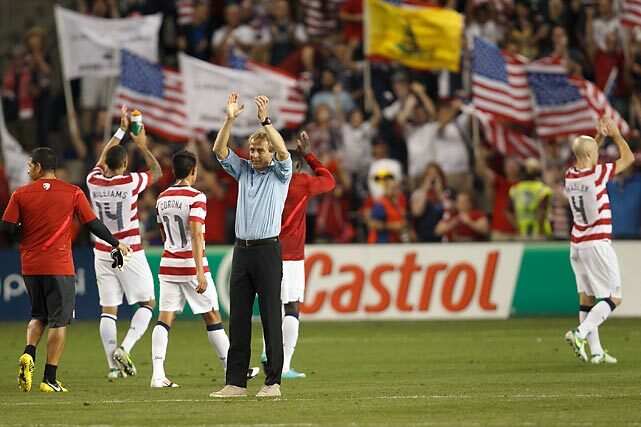 Klinsmann’s teams do not because he’s trying to accomplish so much more than to win the game that day. He’s trying to spark a cultural shift that’s going to take a lot longer to occur than the four years he has left on the bench. It’s a generational, economic and demographic evolution that started in the 1970s and has slowly but surely carried the U.S. this far. And there’s still a ways to go. 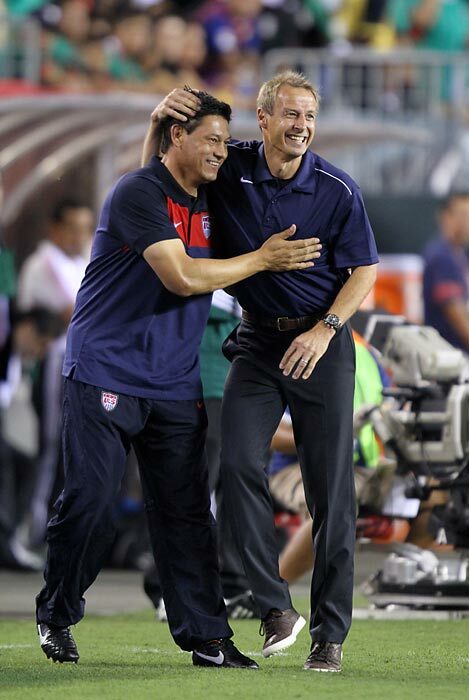 Perhaps Klinsmann will facilitate the process by blazing the proper trail. But for now, the U.S. national team is what it is – a competitive, hard-working, reasonably talented collection of players from a place where soccer is far from the most popular sport. It’s one of only eight to advance to the round of 16 in three of the past four World Cups. But since the tournament expanded to 32 teams in 1998, the eventual champion has won an average of six games during the competition. The U.S. has won six World Cup matches combined over the past 80 years. Klinsmann can change only so much. In his role as technical director, there is progress to be made. He's already influenced some changes at the developmental level, adding additional resources for youth coaches and increasing the number of junior national teams. And soccer’s organic growth will continue. But with the senior side, it’s probably time to be a bit more pragmatic. Sometimes, a comfort zone is good. Tactics that play to a team’s strengths are more likely to be successful. Athletes have a better chance on the day if they’re confident and in command. They can't change where they were born or how they learned the game. They are who they are. Before taking over the U.S. Men's National Team, Jurgen Klinsmann managed his native Germany to a third-place finish in the 2006 World Cup. Here's a look back at his career before he leads the U.S. into the 2014 World Cup in Brazil. 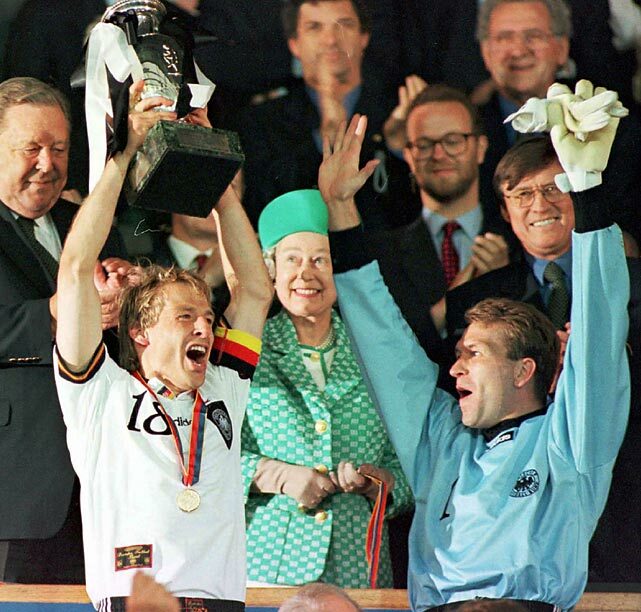 Klinsmann (left) celebrates in 1996 after captaining Germany to the UEFA European Championship with a 2-1 win over Czech Republic and receiving the trophy from Queen Elizabeth II (center). Klinsmann was the first player ever to score in three different European Championships ('88, '92 and '96). Klinsmann poses with the late Portuguese great Eusebio before the 2004 UEFA Champions League Final in Gelsenkirchen, Germany. A month later, he would be named coach of the German national team. 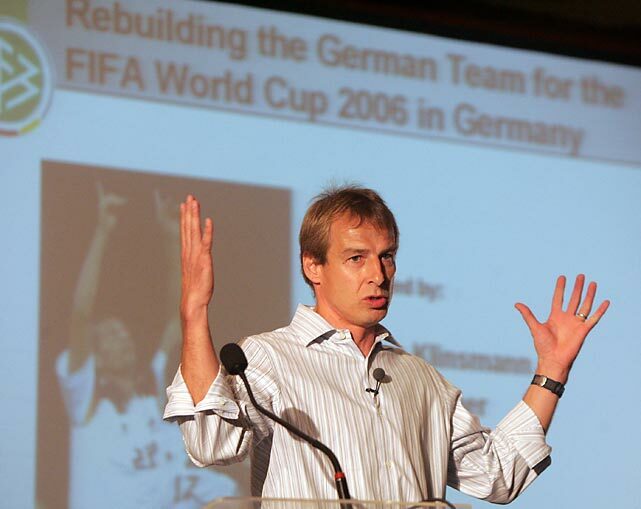 Klinsmann discusses his team-building plans for Germany at the second International Football Forum in Rio de Janeiro, in December 2005. His methods drew strongly from American training programs, as Klinsmann had lived in Southern California since 1998, and those methods initially garnered scrutiny from the greater soccer world. 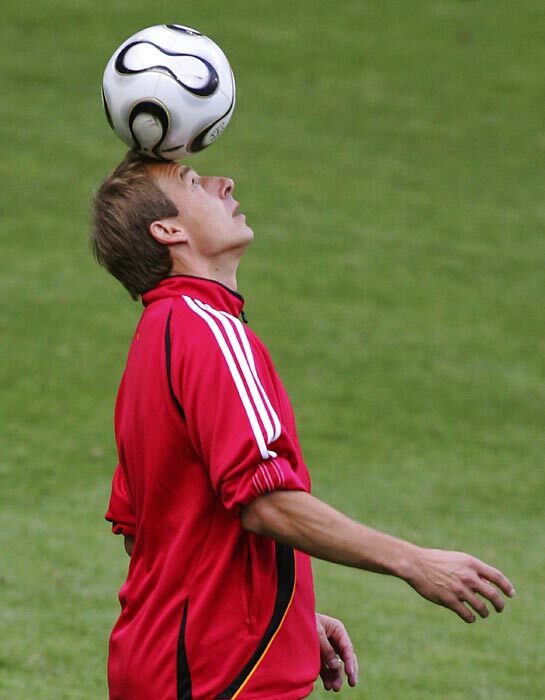 Klinsmann at German national team training in 2006. When managing the team, he would commute to sessions from his home in the United States -- to the frustration of Germany's fans. His non-traditional player selection and philosophies brought criticism that was largely silenced after Germany's third-place finish at the 2006 World Cup. Klinsmann with members of the German national team, including captain Michael Ballack (center), during World Cup training in 2006. A former striker who spent time at such clubs as VfB Stuttgart, Inter Milan, AS Monaco, Tottenham and Bayern Munich, Klinsmann scored 226 goals across 506 games in his professional career. 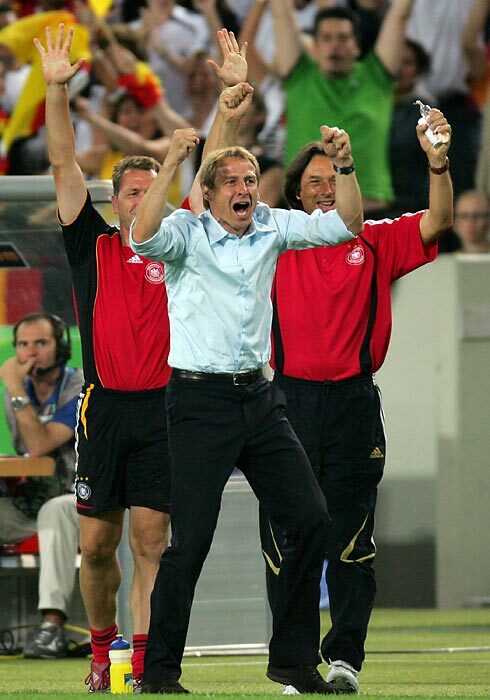 Klinsmann gestures against Costa Rica in the opening match at Munich's World Cup Stadium in 2006, a 4-2 win. After defeating Argentina on penalties in the 2006 World Cup quarterfinals, Klinsmann celebrated with Germany assistant Oliver Bierhoff in Berlin. The two were former teammates in the German side, for which Klinsmann scored 47 goals in 108 appearances. Lukas Podolski receives congratulations from Klinsmann during the 2006 World Cup Round of 16 match against Sweden in Munich. 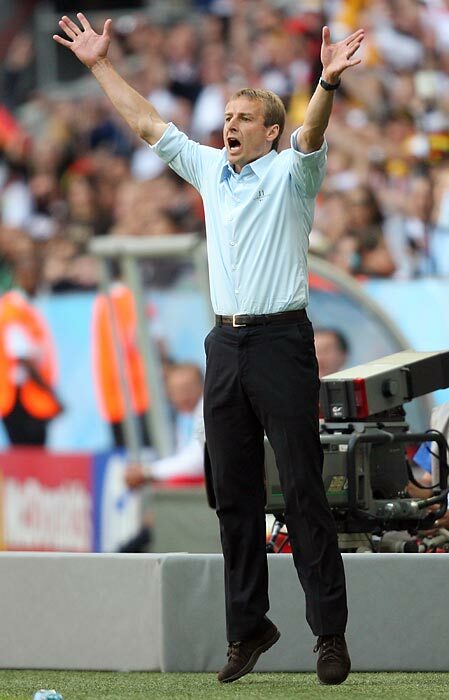 Klinsmann celebrates on the touchline after Bastian Schweinsteiger scores the first goal against Portugal in the third-place game. 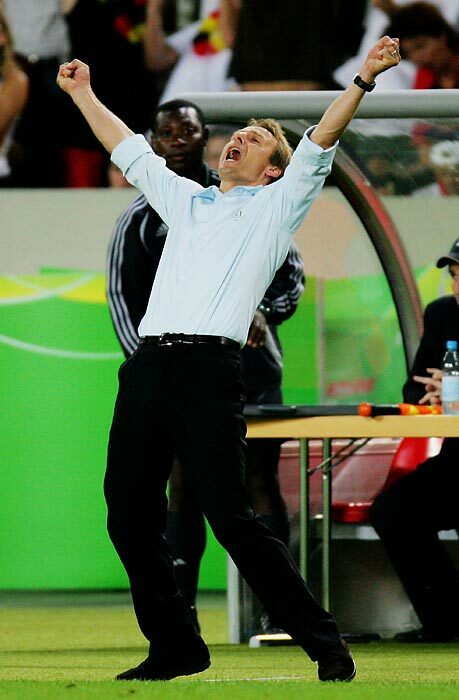 Klinsmann rejoices after Germany won the third-place match against Portugal at the 2006 World Cup. Klinsmann went 20-8-6 in 34 matches as manager. Klinsmann acknowledges the crowd at the medal presentation after winning the third-place game 3-1 over Portugal. Klinsmann would later be named German Football Manager of the Year. 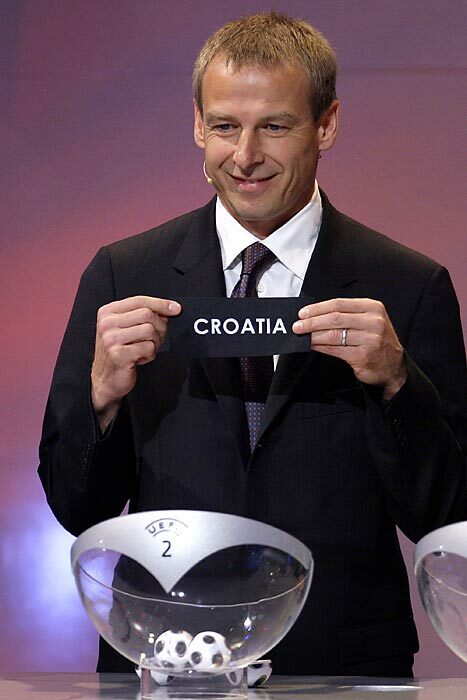 Klinsmann holds Croatia's ballot paper during the UEFA Euro 2008 draw, in December 2007. After the 2006 World Cup, Klinsmann left the Germany post and flirted with the idea of managing the United States. 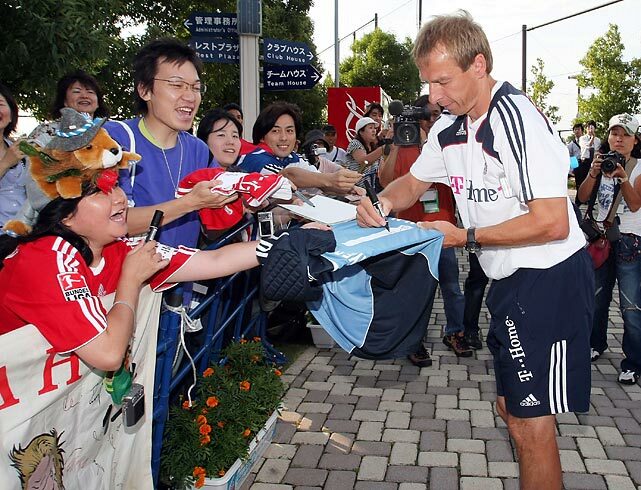 Klinsmann signs autographs for Japanese fans at a practice session in July 2008, having recently accepted the manager job at legendary German club Bayern Munich. Bayern Munich and Klinsmann warm up the day of a Champions League match against Sporting Lisbon in 2009. Klinsmann would manage Bayern for just one season, and was sacked with five games left with his team just three points out of first. Bayern management was also unhappy with early exits in the Champions League and DFB-Pokal tournaments. Klinsmann and assistant coach Martin Vazquez celebrate a goal by Robbie Rogers against Mexico on Aug. 10, 2011. A few weeks earlier, on July 29, Klinsmann was named coach of the United States national team after rumors linked the two for years. 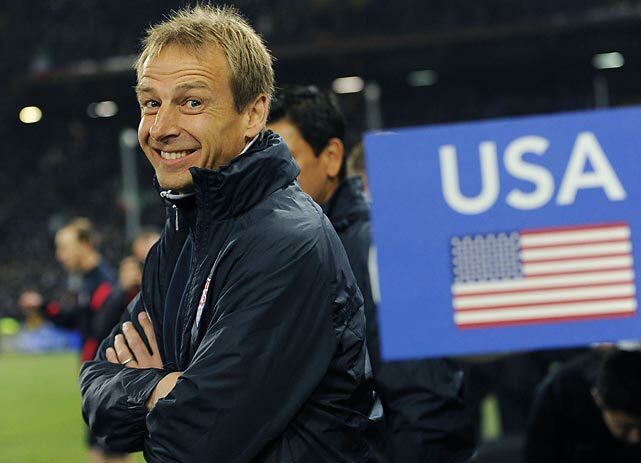 Waiting for the start of a match against Italy in 2012, Klinsmann cracks a smile. Before taking the U.S. job, he'd followed MLS and been a presence at soccer events around the country since 1998, when then-MLS Deputy Commissioner Sunil Gulati tried to get him to sign with the Los Angeles Galaxy as a player. 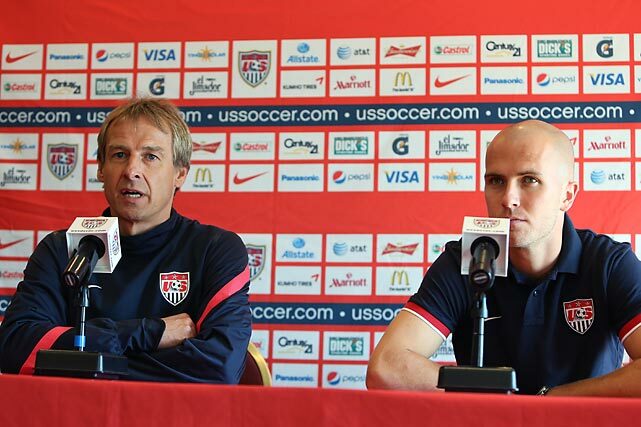 U.S. midfielder Michael Bradley (right) and Klinsmann address the media in 2012. 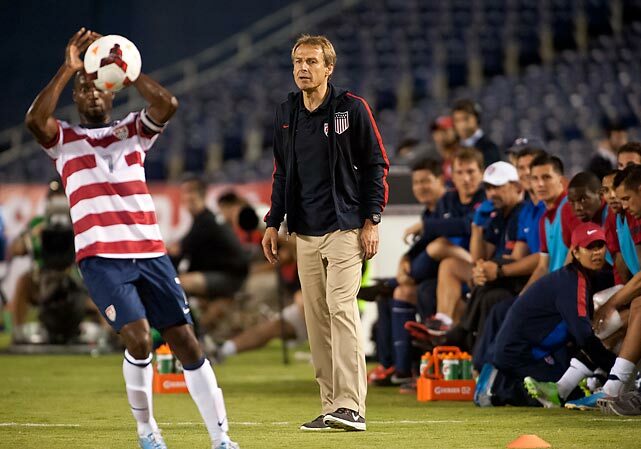 Klinsmann replaced Bradley's father, Bob, as U.S. coach in 2011, intending to create a distinctly American style of play. 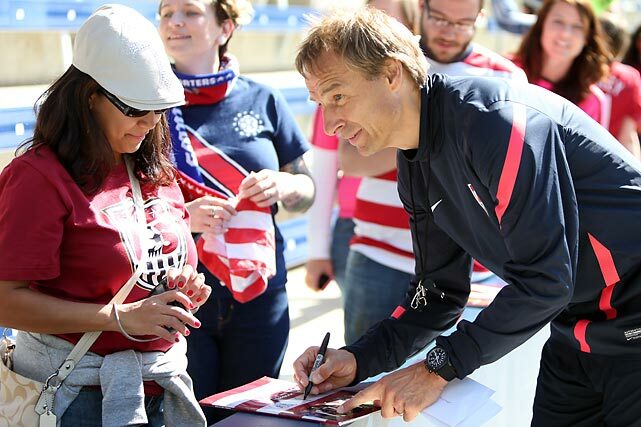 Klinsmann signs an autograph at a public U.S. national team practice in 2012. USA players and Klinsmann acknowledge the fans after a 2014 FIFA World Cup qualifying win over Guatemala in Kansas City, Kan. Klinsmann hoped to implement an offensive, passing-based mentality to the American side. The U.S. men practice in 2013. 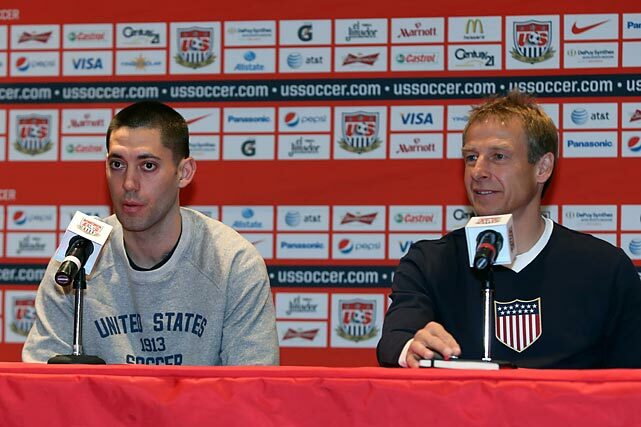 Clint Dempsey and Klinsmann hold court at a presser in Mexico City, a day prior to a World Cup qualifier. 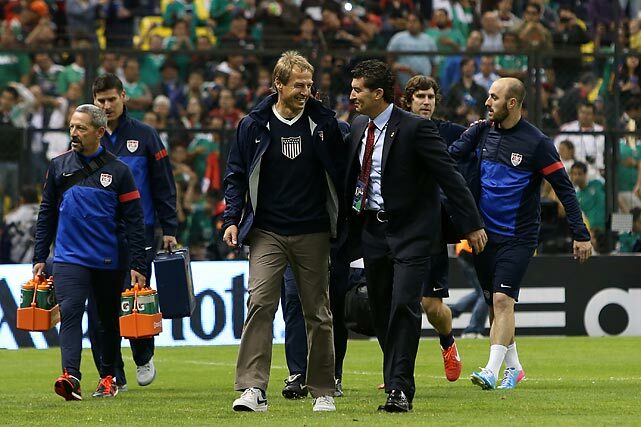 Klinsmann and Mexico head coach Jose Manuel de la Torre chat before the game at Estadio Azteca in Mexico City. 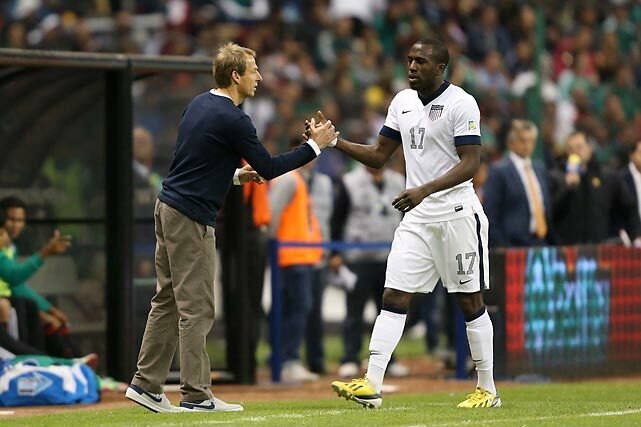 Forward Jozy Altidore is greeted by Klinsmann after being substituted in a 1-1 World Cup qualifier draw with Mexico in Mexico City. 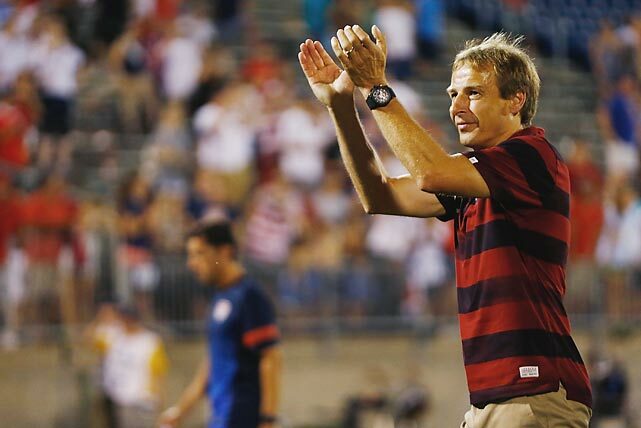 Klinsmann thanks U.S. supporters following a 1-0 win against Costa Rica during the CONCACAF Gold Cup in July 2013 in East Hartford, Conn.
Klinsmann gestures during the CONCACAF Gold Cup semifinal match against Honduras at Cowboys Stadium in Arlington, Texas. The U.S. won 3-1. Klinsmann watches DaMarcus Beasley take a throw-in during a friendly with Guatemala at Qualcomm Stadium in San Diego, Calif. Longtime U.S. star Landon Donovan meets Klinsmann while exiting after scoring his second goal during a friendly against Guatemala in San Diego in 2013. 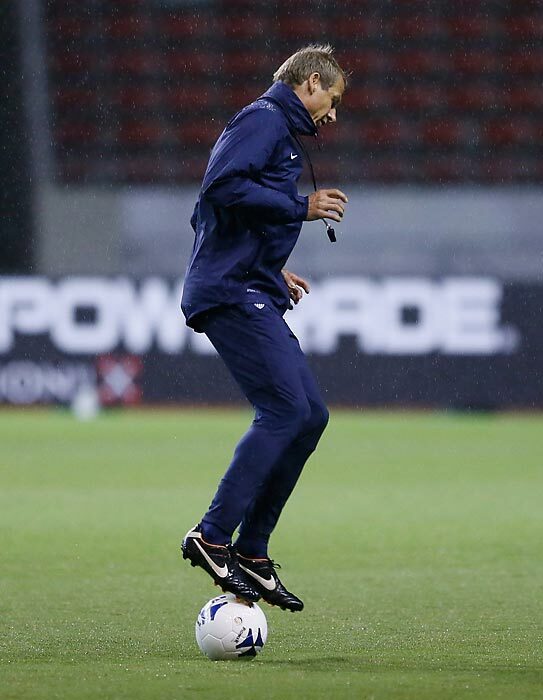 Klinsmann warms up prior to a training session in September 2013 in San Jose, Costa Rica. 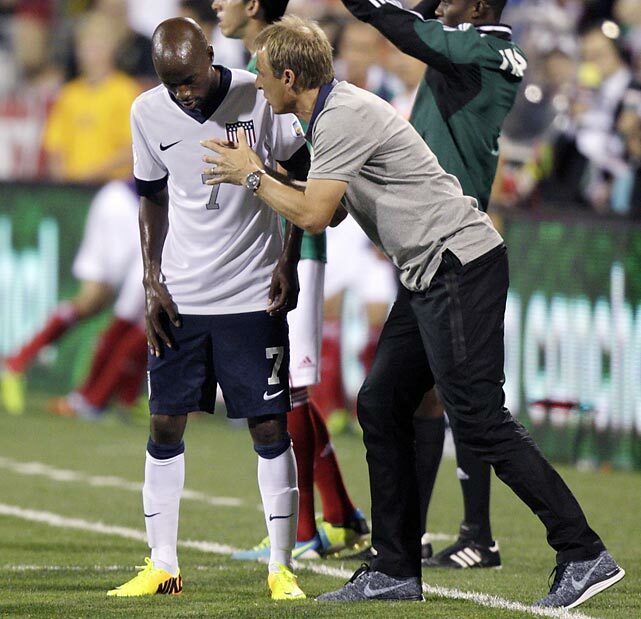 Veteran U.S. midfielder DaMarcus Beasley listens to Klinsmann during a World Cup qualifying match against Mexico in Columbus, Ohio in September 2013. The United States clinched its seventh straight World Cup appearance with second-half goals from Eddie Johnson and Landon Donovan in a 2-0 win. 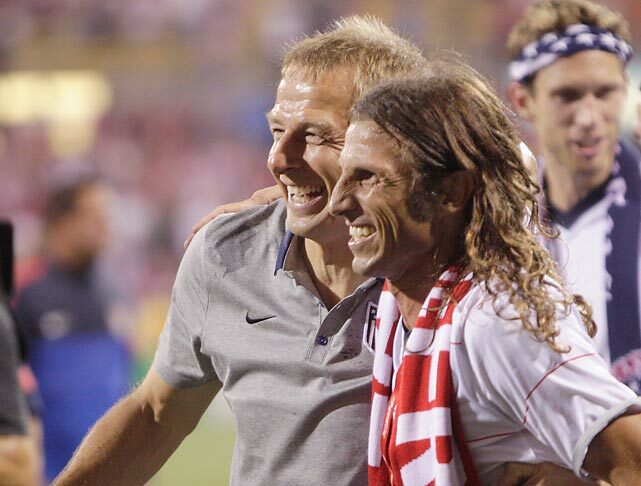 Former U.S. player Frankie Hejduk congratulates Klinsmann after the U.S. clinched a World Cup berth by defeating Mexico. Klinsmann speaks during a press conference at the Sao Paulo FC training centre in January 2014. 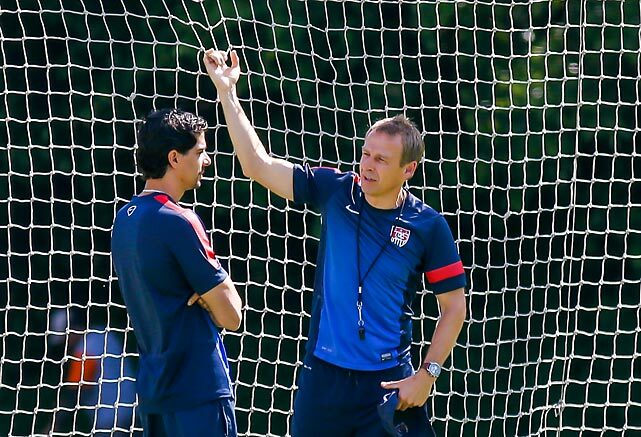 Klinsmann and the U.S. team arrived in Sao Paulo in January 2014 for a 12-day training session to prepare for the upcoming FIFA World Cup in Brazil. Jurgen Klinsmann addresses the team in Sao Paulo in January 2014. Known for picking his squads on performance and not reputation, Klinsmann held true to his reputation in mid-May by leaving striker Eddie Johnson out of the World Cup pool in favor of the in-form Terrence Boyd and Chris Wondolowski.